Cadbury is launching its very first Cadbury Secret Santa Postal Service that’ll be touring ten locations from across the UK from Thursday 15th November. It will provide visitors with the opportunity to send a delicious Cadbury chocolate gift anonymously to someone special in their life, just because. 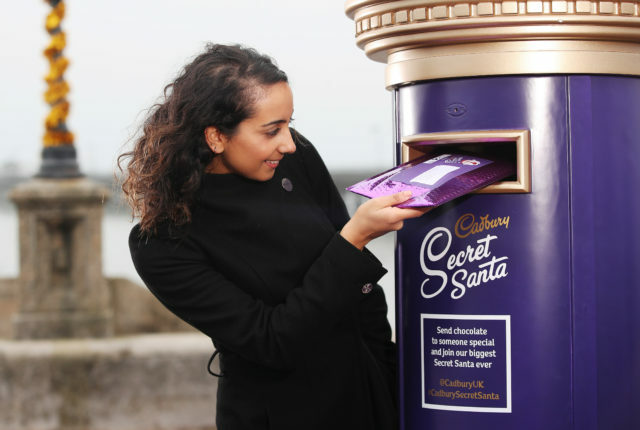 This Christmas, Cadbury is helping Brits unleash their generous instincts and become a Secret Santa by launching its very first Cadbury Secret Santa Postal Service. The entirely free service will provide visitors with the opportunity to send a delicious Cadbury chocolate gift anonymously to someone special in their life, just because. The Cadbury Postal Service will be popping up in ten locations spanning the UK – starting in the Isle of White – ending in picturesque Edinburgh on 17 th December, stopping in various cities and towns along the way. Visitors will also have the chance to enjoy the delicious taste of Cadbury Dairy Milk whilst they await their Secret Santa status. generous instinct and become a Secret Santa this Christmas. Available on a first come, first-served basis, there is no need to book to get involved.